It’s a Sunday morning tradition, each weekend we spend Sundays making a big family breakfast. Nothing is off limits – quiche, french toast souffle, waffles, scones, and of course homemade buttermilk pancakes. Pancakes are the girls favorite and something I ‘batch make’ to feed them for a few weeks. I used to freeze all of their baby food and seasonal fruit, so I added pancakes to the monthly freezer meal list. 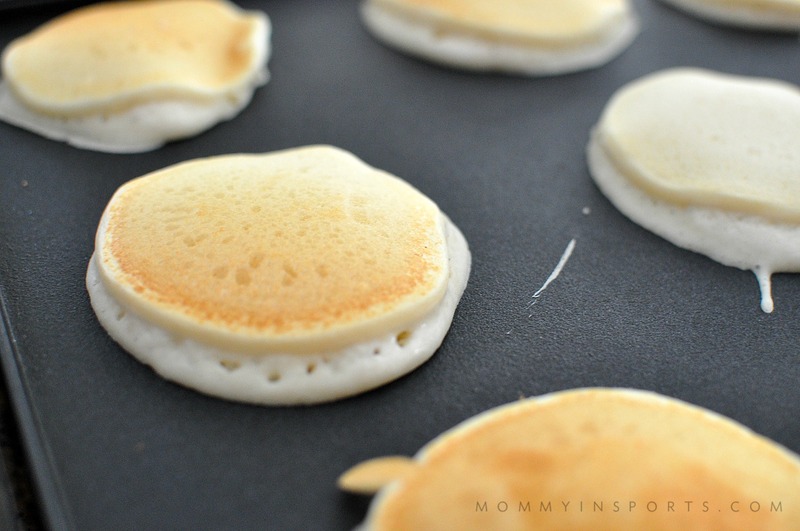 Freezing pancakes is so simple, and makes school mornings a breeze! I’m not a fan of boxed foods these days. Ever since going (mostly) Paleo, I’ve really tried to limit the processed foods the girls eat. Sometimes I mix up gluten free flours with coconut milk, or try different flavor pancakes, but this round we did our favorite homemade buttermilk pancake recipe. 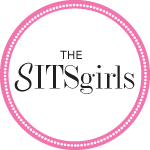 It’s so simple I know it by heart, and I love that the girls are eating wholesome foods made by me each morning! They love chocolate chips or blueberries added in, and on birthdays we celebrate with sprinkles! The result is a delicious, hearty, and organic breakfast every time! 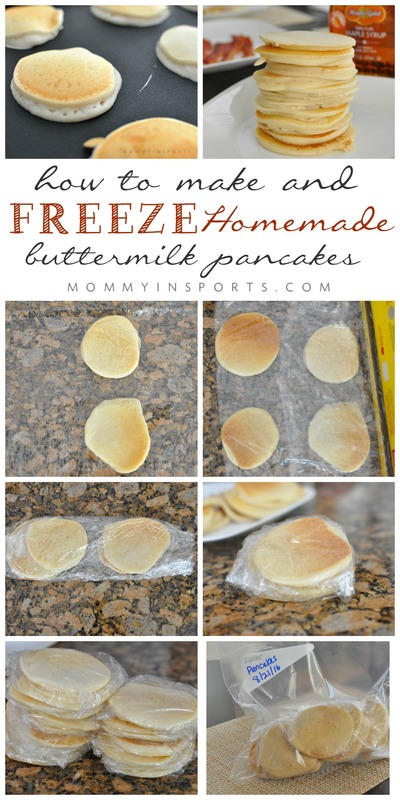 Once we’re done devouring our homemade buttermilk pancakes it’s time to freeze! I prepackage the pancakes in sets of four, because each of our girls eat two pancakes. All you need is some cling wrap or tin foil, and a freezer bag. I’ve seen tutorials including parchment paper, but who has time to cut? I just make sure to package in the number of pancakes I want to reheat in each individual package. First I put down two pancakes, then fold over the cling wrap so the next group don’t touch. If they do, they stick together and are hard to reheat! Then keep folding until they are air tight. Put them in the freezer bag, date, and tada…you’re done! Make sure you take all the air out of the bag to keep them nice and fresh for one to two months. I reheat them on a plate with a microwave cover for one minute and they aren’t too hot for the kiddos. 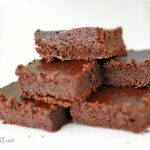 Hope you enjoy this recipe and don’t forget to make a double batch to freeze! Add all the dry ingredients together. Then mix in wet ingredients and whisk together. Cook on medium heat on a griddle coated with cooking spray. Flip when the batter bubbles! This recipe is SUPER versatile. Feel free to sub gluten-free flour, whole wheat flour, or even almond flour. The liquid can be coconut milk or almond milk as well. You can even mix in mashed bananas, pumpkin, or chopped apples and cinnamon! Recipe yields: 9 large pancakes, or 18 smaller size. Need more breakfast inspiration? 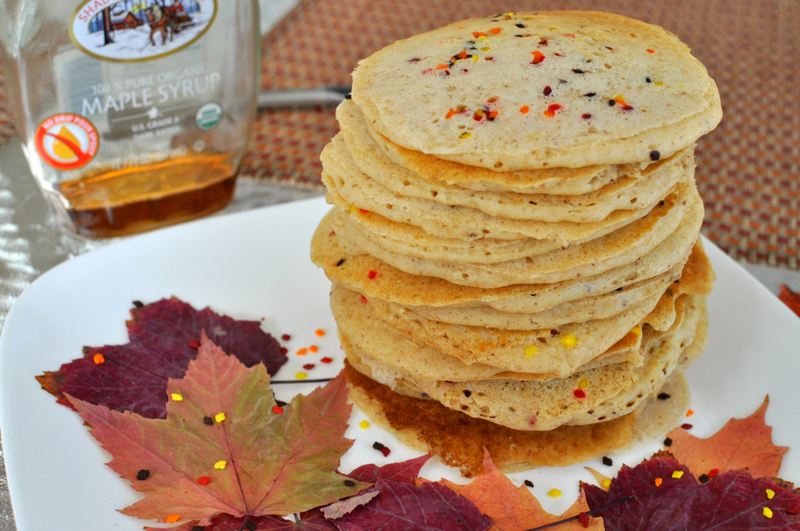 Check out these whole wheat pancakes! 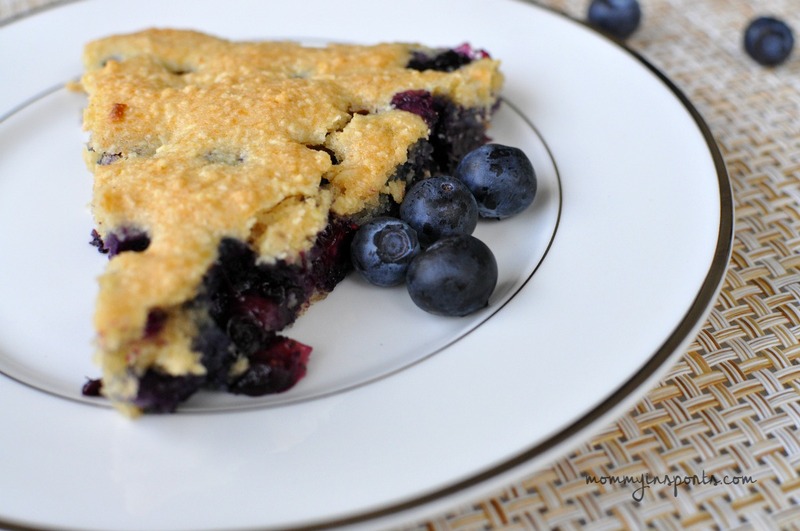 Or you may love these paleo blueberry scones! 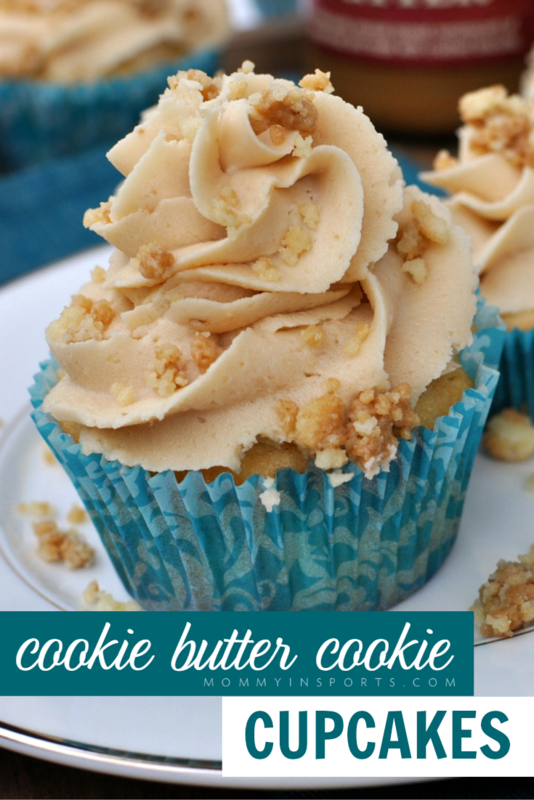 And if you are looking for a decadent treat, you will devour these cookie butter cookie cupcakes which were featured in Food & Wine! And don’t forget to follow along on Facebook for more recipes! I need to do more of this now that we’re in the new school year. 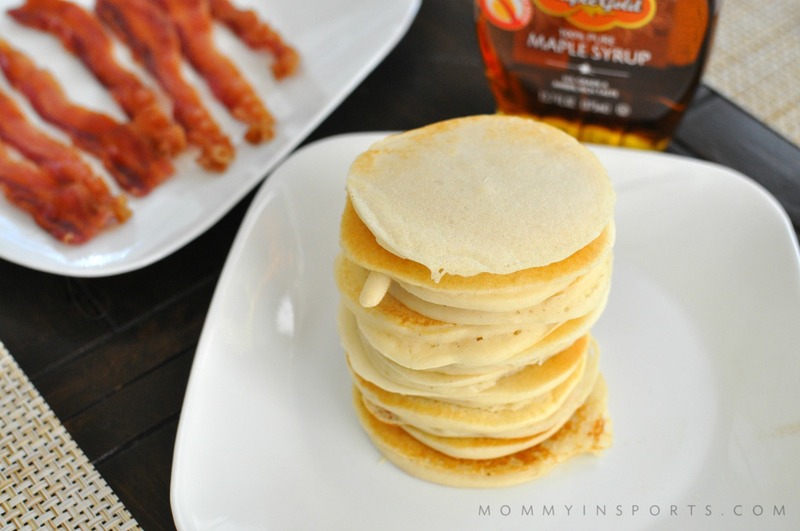 My kids would love pancakes on school mornings! just takes 1 minute to nuke!! 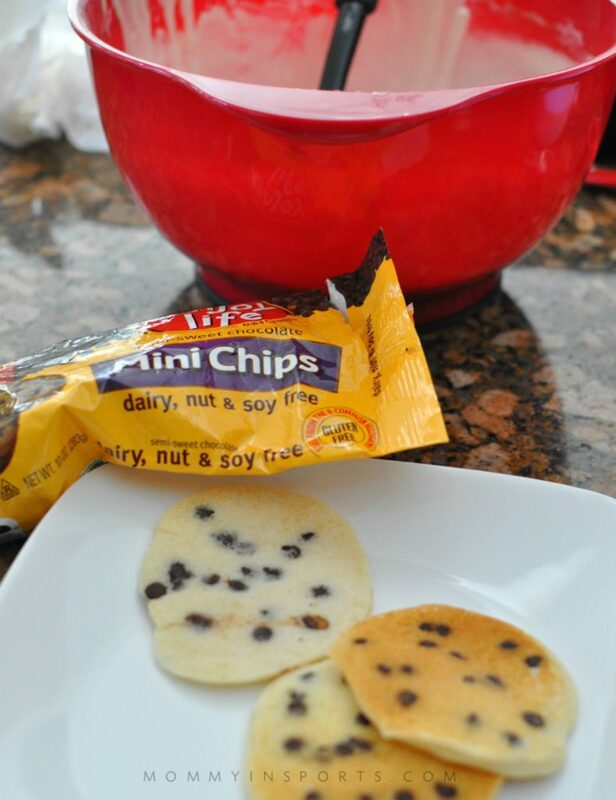 I love the idea of freezing my own pancakes … maybe I can find the time again, soon, to start making real breakfast on the weekend and make a big batch to freeze for the week. Probably a lot better than the frozen ones in the store too. SO much better, and no additives or preservatives! Such a good idea! I buy mine at the store, but I should really make a big batch of them and freeze them since I do want to know what is in them. I love the idea of the Sunday morning tradition. And this looks amazing! Will certainly be trying it out! Thanks for the recipe.